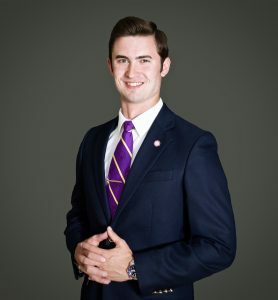 Colton Williamson, a University of Montevallo senior from Hazel Green, Alabama, was recently elected student trustee for UM’s Student Government Association. Williamson is a senior finance and marketing double major at the University. In addition to serving on SGA as trustee, he also serves as the college of business senator. Williamson is an honorary member of the National Society of Leadership and Success, president of the Student Athlete Advisory Committee and is involved in many other organizations on and off campus.